Cansec knows security doesn’t have to be complex. SmartLock® is a simple, reliable access control system capable of an unlimited amount of facility codes for Cansec 37, 26 and 35-bit Corporate 1000 Wiegand format credentials for high-level security. SmartLock was designed from the ground up to be powerful, while setting a new industry standard for ease of use. SmartLock® Pro Plus is a powerful and intuitive access control solution for up to 120 doors and 4800 users. 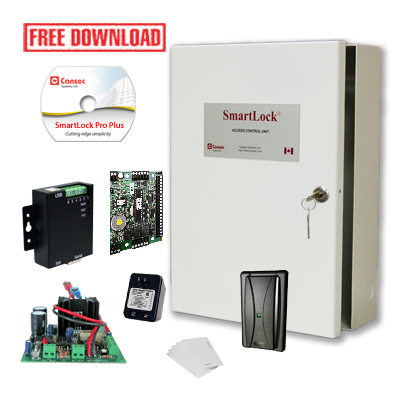 Additionally, SmartLock® Pro Plus can disarm DSC or Honeywell intrusion panels when an authorized credential is presented at a reader. Optional software allows for seamless NVR integration, Enhanced Attendance Reporting, and Photo Badge Integration with Asure ID. DSC/Honeywell Intrusion Panel Integration - SmartLock Pro Plus can disarm a DSC or Honeywell intrusion panel when an authorized credential is presented at a reader. Photo View - Displays cardholder photos when their card is used at all or selected readers. Audit View - Allows users on remote computers to view the real time audit transactions. User Management - Allows Personnel or Human Resources departments to add and delete users from the SmartLock Pro Plus system. Momentary Unlock - Allows receptionists to momentarily unlock one or more selected reader equipped doors from any LAN connected computer to allow access to non-cardholders. *Important: Requires Pro controller firmware. **Important: Requires Pro Plus controller firmware.